With only 3 days to cover, the trains were our best friend getting around. 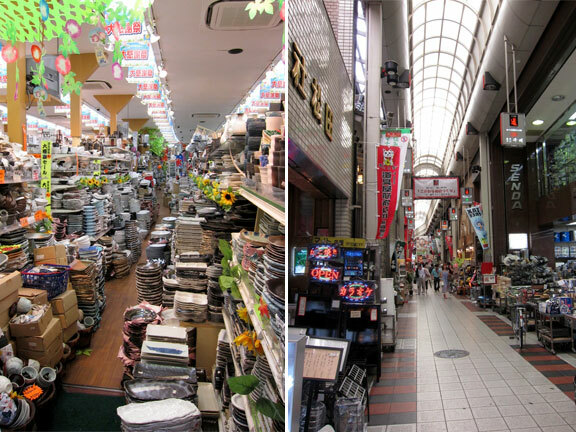 Osaka is just the third largest city in Japan; but it is no less massive and sprawling. 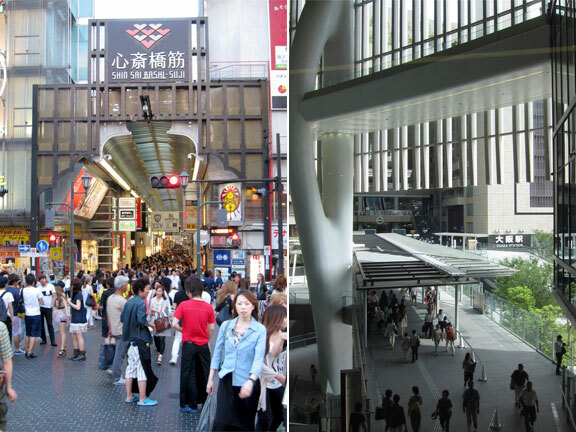 Plenty more buildings and structures as compared to Kyoto and the air is less formal; more commercial. Shopping here is huge. There are several districts for specific goods (as electronics, designer fashion, etc.) and covered walking streets filled with stores that literally go for miles. Whole department stores take up the entire underground areas of large subway stations and food is available on the street for all-nighters. Massive ferris wheel atop a mall. 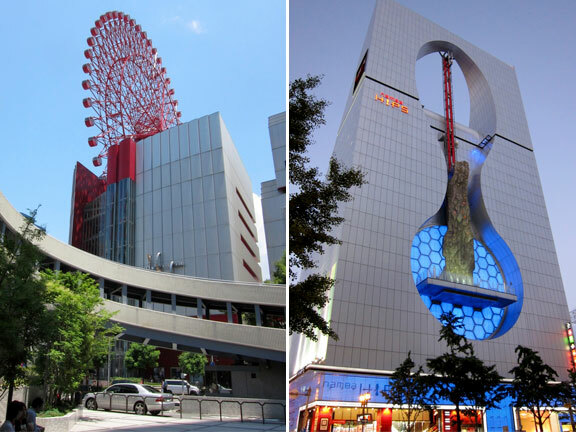 A rock climbing wall on the outside of a high-rise building; a freefall ride atop that. No takers. But a must go shopping street for cooking enthusiasts is Doguya Suji. Anything and everything cooking related, from home to professional grade. Pots and pans, appliances…and knives. I have mentioned going to Aritsugu in Kyoto and held off buying some artisan knives. And seeing the dizzying array of beautiful “wood grained” pieces here was a bit of torture as well. 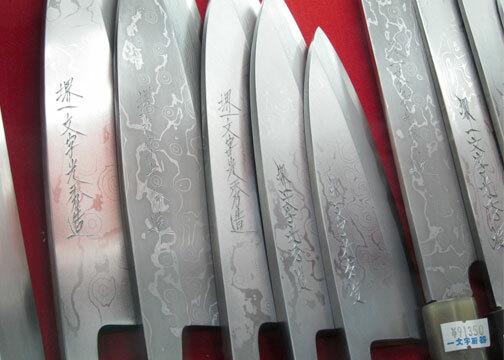 Traditional Japanese knives are relatively harder and retain their extremely sharp edge for a longer time as they are hand forged and made up of a combination of metals. (As opposed to sharpening stamped sheets of stainless steel.) They are also only beveled on one side so a left handed cook will use a different kind of knife as a right hander. But if not used everyday, will rust. They need a bit of extra care, so again, I decided to not get one. 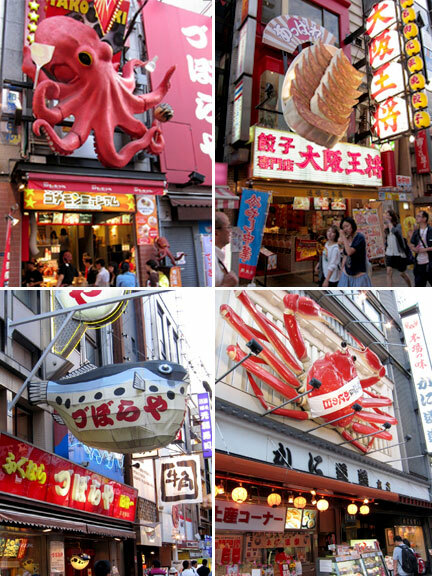 If we’re talking eating streets then Dotombori is king. During the day, it’s just like any street with a lot of restaurant. But at night, neon lights and billboards and thousands of pedestrians turn it into something else. 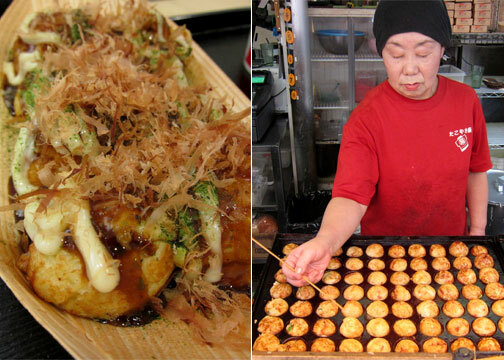 It’s here where one can find many examples of Osaka staples as takoyaki. 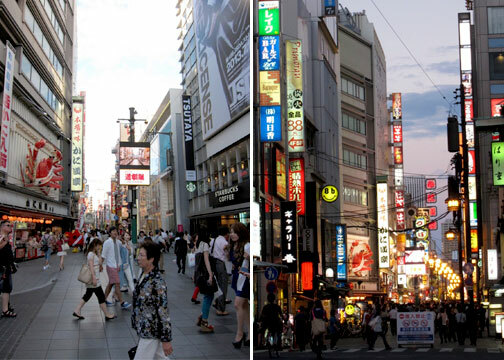 I tried several stalls and shops in and out of Dotombori but, unfortunately, have felt underwhelmed by all. A little too pale, a little too gooey/raw inside. Then again, maybe that’s how they like it. Still, Gindaco is tops for me in terms of this spherical snack. 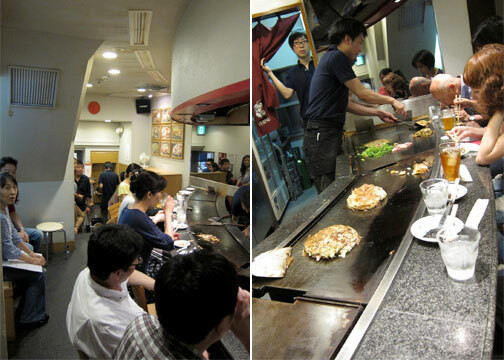 On the other hand, our okonomiyaki experience was quite excellent. We had found Mizuno in one of the side streets and there was a long line outside. So we had decided to come back the next evening a little earlier to avoid the queue. We were seated on a barely 10 seater bar with a flat grill running the whole length. The pancakes were then cooked in front of us. We had a more traditional one with large scallops and pork loin as a base. These were then covered in a batter made with eggs and yam flour, topped with katsuoboshi (bonito) and then slathered with a sweet, salty brown sauce and Japanese mayonnaise. We had also ordered a modernyaki, essentially a pancake made with noodles, in this case what seemed like soba. 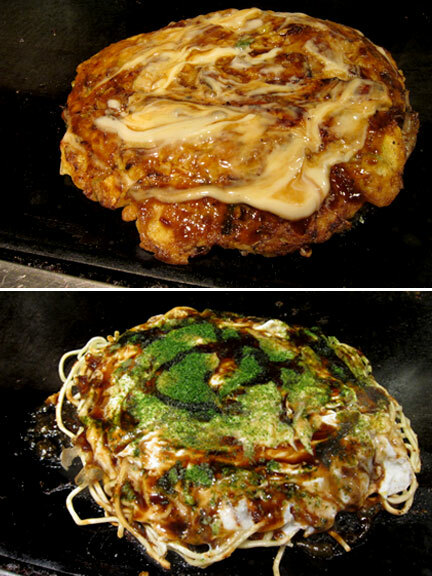 Topped with the same sauce, aonori (seaweed), and mayo. 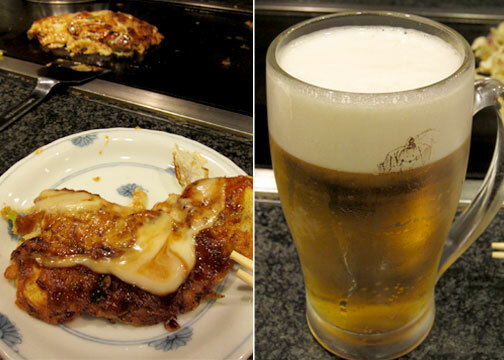 Both specimens I dusted with spicy togarashi and drank with a delicious Yebisu beer. A light to medium bodied, crisp brew with an extremely thick, creamy, fine-bubbled head. I highly recommend this place but come a bit early to avoid the crowds. Fugu (blowfish) is also quite popular in Osaka. And I decided to have a full-on fugu meal at Zuboraya, one of the more popular specialty fugu restaurants. 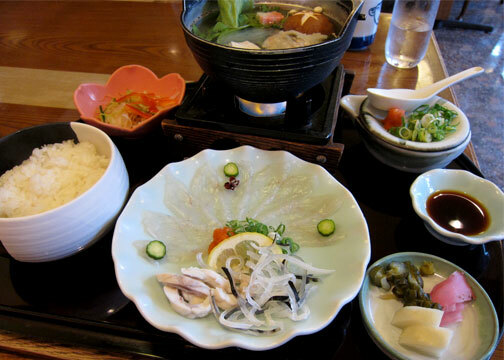 Consisting of sashimi, boiled meat strips, a salad made from its skin and a fugu nabe or soup. Of all I liked the sashimi the best; mouth tingling sensation and all. It’s a pretty bony fish with a slightly elastic flesh. Otherwise it was nothing particularly remarkable in terms of flavor. And given that it’s extremely poisonous, it’s more “been there done that” for me for fugu. 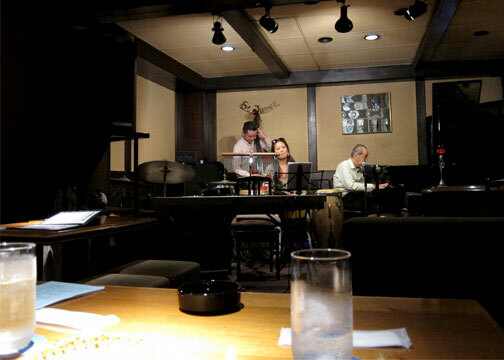 For a laid back nightcap, and if (real) jazz is your thing, head up to St. James, a small club located on the 4th floor just along Dotombori. Many jazz greats from all over the world have come and played in this unassuming venue. And there’s live music every night, most times with the owner, a renowned musician, on the keys. Japanese style highball ( a.k.a. whisky soda) in hand, a great way to wind down after all that eating. And shopping. And walking. Never mind the toro, look at that uni! 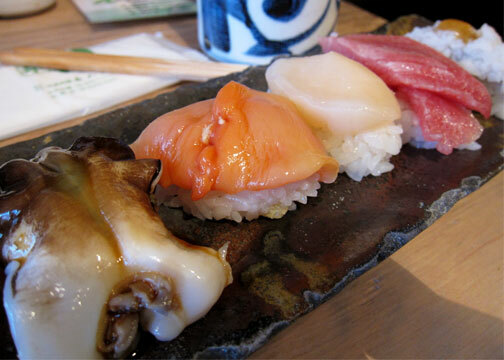 Dotombori aside, food wise, we had allotted a morning to visit Endo Sushi, located just beside Osaka’s humbler counterpart to the Tsukiji market; the Osaka Central Wholesale Fish Market. 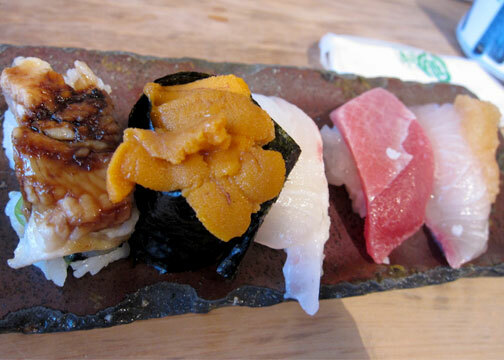 You order from an “omakase” selection of four plates; with each plate consisting of different varieties (five pieces) of nigiri sushi. You can also just specify for certain items if you wish. The freshness of ingredients is unreal. And the rice is packed just so that it breaks apart as you bite into it. Each grain of rice is whole (not clumped together), plump and glazed with rice vinegar; goes so well with the sweet seafood. Each piece is given a dab of fresh wasabi and all one has to do on the table is paint some soy over the fish with a brush. Then eat. Incredibly reasonable for the quality at Y1000 per plate (roughly less than P100 per piece). Some of the best sushi I’ve ever had. But don’t forget to order a side of their miso soup. A delicious blend of several types of pastes, the broth a deep red, and packed with clams. Worth the train ride. Craving something sweet? 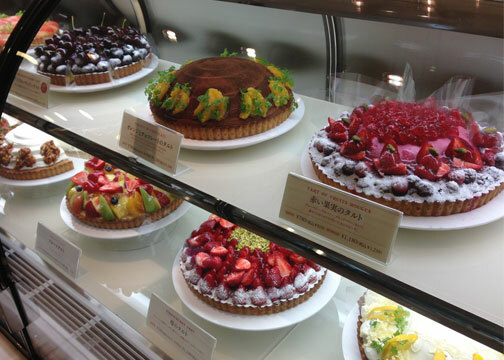 Over at Namba Parks, a green inspired shopping complex, we again were stopped in our tracks by a decadent display of pastries. Such mouthwatering presentations of fruit pies and tarts. 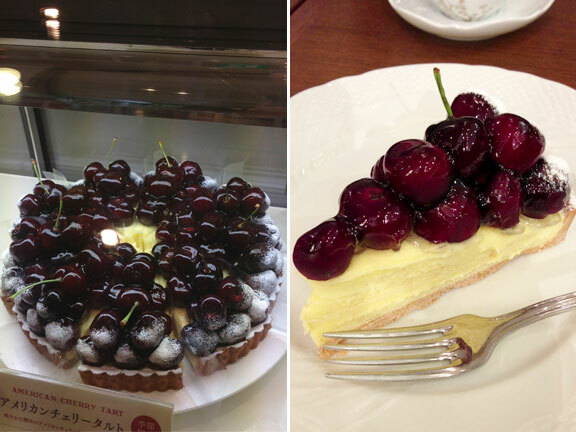 Stone fruits being my favorite, I just had to have a go at the American cherry tart. Look at it. There must be a kilo of fresh cherries on that. And nothing was done to the fruit except it was pitted and painted with clear gelatin. With that delicious pastry cream was heaven. The name of the place: Delices du Palais. 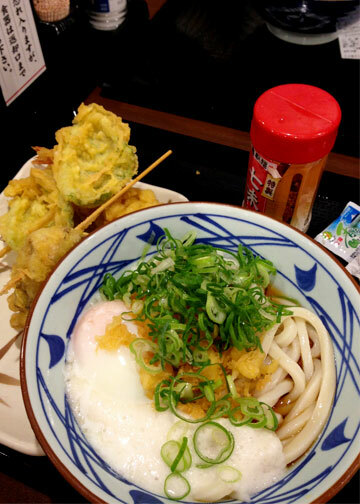 Our last meal before heading out to the airport was at this simple, quick service noodle joint called Marugame Seimen. Over a bowl of chewy udon with onsen egg, yam paste and dipping sauce, plus some skewered tempura veg on the side, it pained me to think I would probably never get something this good in even the better Japanese restaurants back home. In it’s open kitchen you could see them make all ingredients from scratch. 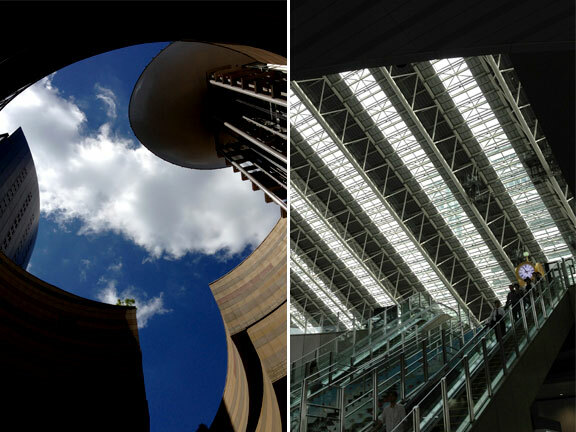 Three days in Osaka is hardly enough time to cover everything. But around every corner, you will find, more often than not, good eats. And probably something strangely cool. Great post AP! 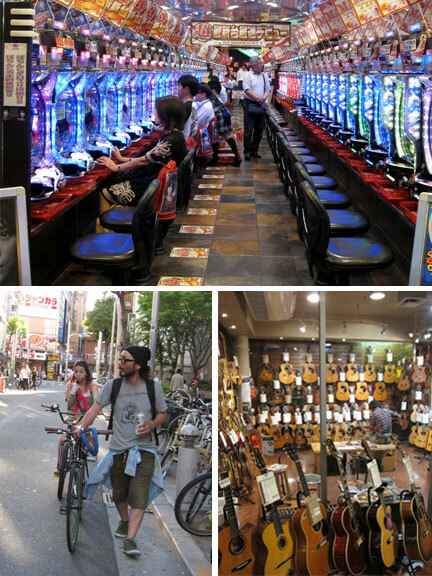 We're considering spending my birthday in Osaka next year, and this may have just convinced us. Thanks for this. The sushi and udon look amazing. Did I read the price tag correctly on that knife? ¥91,350 for one knife? I highly recommend Endo Sushi. What a meal. And yes that's the correct price on the knife. Though I was looking at a more modestly priced one, not that exactly.